Soak chopped apricot with sufficient milk for 1 to 2 hours. Make smooth paste. Keep aside. Take one bowl, add hung curd, apricot paste, chopped strawberry, honey, 1 fiber biscuit crushed and mix well. Keep aside. Take Martini serving glass. Make 1st layer of crushed fiber biscuits. Put 1 round piece ok kiwi over crushed fiber biscuits. Pour 2 to 3 tablespoons curd mixture and make layer. Sprinkle 1 to 2 tablespoons crushed biscuits and maker layer. 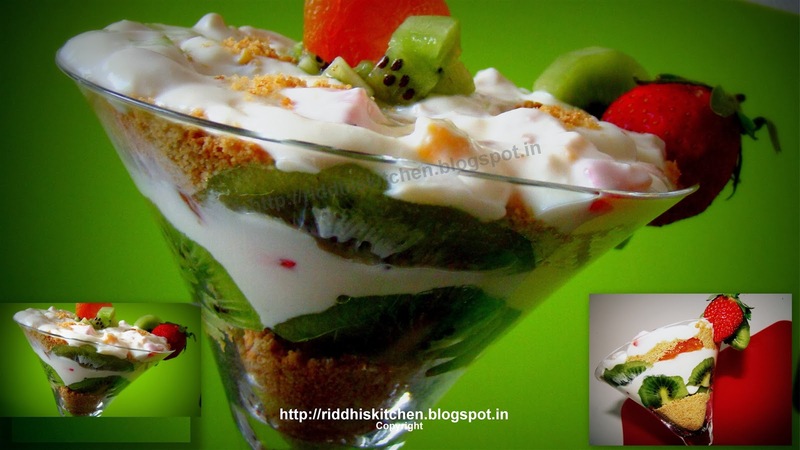 Again pour curd mixture, sprinkle some crushed biscuits and garnish with fresh strawberry, kiwi slice and dry apricot and serve it. Tip : I make this dessert healthy way. you can use whipped cream instead of yogurt.